Detecting conformity in real data implies thus finding a particular sigmoidal relation between the frequency at which a cultural trait is present and the probability to copy it (see the figure below). 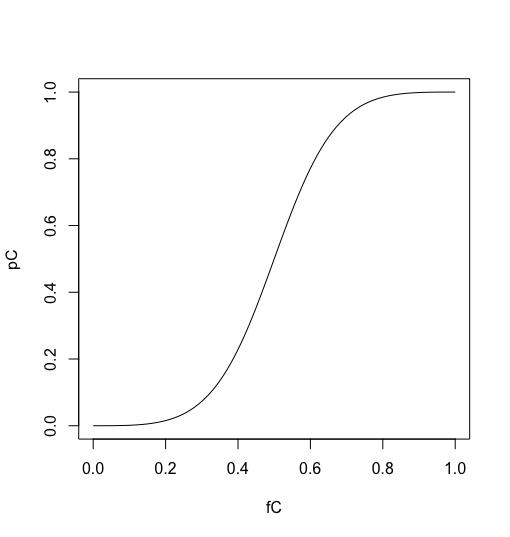 This means that when a behaviour is popular the probability to copy it (pC) is higher than its frequency (fC) (top-right corner of the figure), and that, when a behaviour is unpopular, the probability to copy it is lower than its frequency (bottom-left of the figure). We can simply call this “the sigmoid” (Ed calls this the “Holy Grail of conformity”). I begun to study conformity for a series of converging reasons. First, a general interest about the relative importance of context-based biases, or local factors of attraction, versus stable content-based biases, or general factors of attractions. In intelligible language: what is more important for the success of a cultural trait? Is it being already popular, or endorsed by famous – prestigious individuals, or are some inherent features that are evaluated by individuals? Is Nespresso good, or George Clooney irresistible? Cultural evolutionists tend to pay more attention to context-based biases (George Clooney), but I believe that this is an interesting empirical problem, on which – surprisingly – not many studies have been done. Conformity is one of the most discussed context-based bias, but the empirical support for its existence is not uncontroversial (even according to cultural evolutionists themselves). Second, it looks like conformity is not easy to implement in individual minds. How does one copy disproportionately? In a highly influential modelling paper, conformity is implemented as a “rule of 3”: pick three individuals and copy the majority of them. This works well, and it seems straightforward to do, but we simply do not now whether this happens in reality. In addition, recent claims that conformity has been found also in non-human animals make this problem intuitively more pressing. We thus started to wonder whether the sigmoid could come about also in absence of an individual-level conformist bias, so that genuine empirical findings of the sigmoids might not necessarily reflect the presence of conformity (here the “confounds” of the title). In a first model, now in press in Animal Behaviour (pdf here), we considered the differences arising by tracking the frequencies of behaviours versus the frequencies of individuals to test the presence of the sigmoid. The main result is that when tracking the frequencies of behaviours sigmoids can appear even when individuals copy at random, so in absence of any conformity bias. Why is it so? Imagine to initialise a population with two behaviours (let’s call them A and B) at random, and have individuals simply copying each other. By definition, the probability to copy a behaviour is equal to its frequency. If 70% of individuals perform A, one has a 70% of probability to pick an A-individual and to copy it. So our plot above would be a nice straight line from the bottom-left to the top-right of the square. No conformity here. Imagine however you are tracking behaviours. As they have been initialised at random, A and B will be roughly in proportion 50-50 at the beginning of each simulation. Now imagine that, after some time steps, 70% of individuals perform A as above. As above the probability to copy A will be 70%, but the cumulative frequency of the behaviour A will be somewhat less than 70%, as it started from 50%, thus creating the sigmoid. A similar way to think about it: imagine B disappeared from the population. The frequency of A-individuals is 100% (as well as the probability to copy it), but the frequency of A-behaviours will never reach 100%, even though asymptotically tending to it. This may look like a weird effect of the modelling assumptions (especially the random 50-50 initialisation of the population), but, in a subsequent model, we showed that the same logic can be applied in a more realistic scenario. Imagine now that the population starts naive, i.e. no behaviours are present at the beginning, and they are “invented” with some probability. The only twist is that innovation rate decreases over time (perhaps because individuals become more conservative, or similar). This scenario creates exactly the same situation of the model above. A and B have similar frequencies at the beginning, and after a while the population converge on one of the two. Again, tracking the frequency of behaviours creates a sigmoid relation, but individuals simply copy at random. In the next, even more exciting, post, I will present the results of another model, just published in Scientific Reports, that shows that sigmoids can be created when individual frequencies are tracked, but other individual-level mechanisms, i.e. not conformity, are acting.